With a Donald Trump Saturday Night Live episode just around the corner, the always-anticipated, ever-awkward promotional vids have been making the rounds. From walking on camera donning sunglasses in an attempt to impress the ladies to having Cecily Strong attempt a Donald Trump impersonation for an excruciatingly long 10 seconds, the clips pretty much go from bad to worse. We all know that if Trump were to hand off the gig to his eldest daughter, Ivanka wouldn't let those promos go live if they were anything less than perfect. So here are six reasons why Ivanka Trump should be hosting SNL instead of her father. Yes, Donald does too. But maybe that's why his SNL appearance isn't all that exciting. We've seen him on our television screens every week for how many seasons of The Apprentice now? Ivanka's appearances on her dad's show always seemed like a treat. She knew how to handle herself on camera, and we never got tired of her. OK, so no one probably thinks of Ivanka Trump as the go-to source for a good laugh, but the woman can appreciate when something's silly. She can also hold her own with the likes of Conan O'Brien and Jimmy Kimmel on late-night TV. Ivanka may keep it extra classy at all times, but she knows how to give a joke as well as take one. I mean, come on. The woman is always impeccably dressed and she runs her own fashion brand. Is there even reason to think there's any competition in terms of whose ensemble would inspire us more during the SNL monologue? Trump will probably don his "Make America Great Again" cap, which we don't need more of. Ivanka already has two kids, so she's no first-timer to being pregnant and is probably pretty good at keeping her cool even in moments of "I'm actually having a child" stress. But it's not often that we get an SNL host with a baby bump, and I'm guessing that the SNL writers would get that pregnant belly into the story line for at least one sketch. Instead of hiding away, Ivanka could put her pregnancy front and center. Shout out to expecting moms everywhere! When ET interviewed Ivanka and asked about her dad's upcoming appearance on the show, she replied, "Obviously, SNL is the pinnacle, so I am incredibly excited." Ivanka knows that SNL always deserves respect for being, well, SNL. And that should be reason enough. While her father has been caught time and again making disparaging comments about pretty much every female, from Heidi Klum to Rosie O'Donnell, Ivanka stands up for women. Trump started an initiative through her brand to celebrate the modern working woman, using the hashtag #WomenWhoWork. 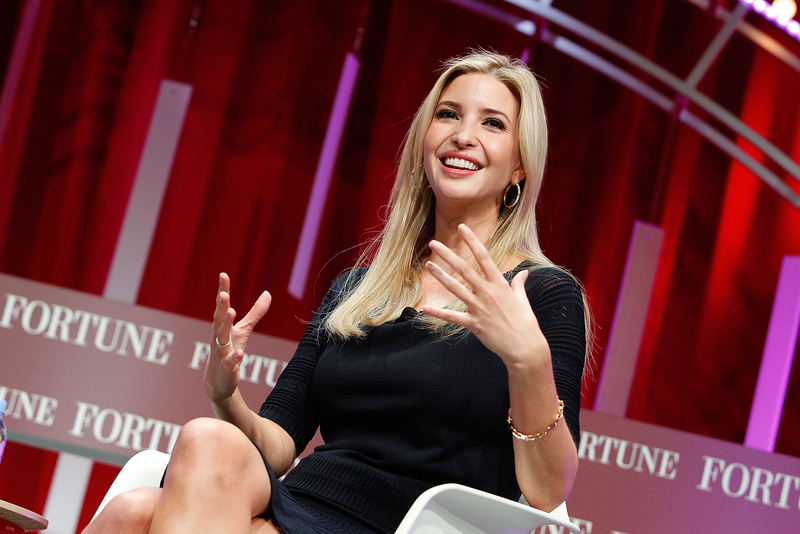 She also spoke at this year's The Most Powerful Women Summit, held by Fortune, and said afterward that she was honored to participate in the conversation. No, Ivanka, we're honored. Now do us a favor and snag your dad's spot on this week's SNL episode.